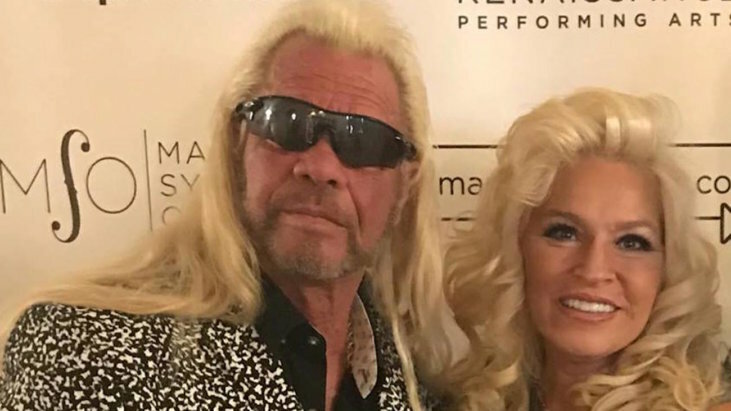 A few months back, it was revealed that Beth Chapman — wife and co-star to Dog the Bounty Hunter (aka Duane Chapman) — was again battling cancer. In a new interview with DailyMailTV, Dog candidly discussed his wife’s cancer battle, and the struggle of trying to balance treatment and bounty hunting. Beth was first diagnosed with stage 2 throat cancer in September 2017. She had surgery, and was declared cancer-free at the time. However, in November 2018, it was reported that Chapman was rushed to the hospital after having difficulty breathing. The family attorney released a statement shortly afterwards saying the 51-year-old reality star is once again facing cancer. This time, the cancer has apparently spread to her lungs, and progressed to stage four. Dog is really torn up about his wife’s diagnosis — getting candid with DailyMailTV about how scary the thought of losing Beth is. “My baby has cancer and she is fighting like hell,” Dog said in the new interview. “I have cried a lot over this because Beth is my everything … Despite all of the obstacles I have overcome, this is by far the biggest test of my life and mark my words, I will not let her die … she is my rock and my bodyguard. I will do everything I can to keep her here. Despite Beth’s diagnosis, the couple is still set on filming their new series “Dog’s Most Wanted,” which is set to premiere on WGN America in May. When Beth was first diagnosed with cancer, she underwent surgery and chemotherapy. This time, Dog said, she is trying out an alternative therapy that he claims allows her to enjoy her life more … though he didn’t give specifics about exactly how Beth is being treated. Though we caution anyone facing cancer against going the alternative route instead of using proven treatment methods, Beth seems to be feeling pretty decent. In his interview, Dog said she’s still “the boss” — and clips of the upcoming TV series feature Beth looking as tough and lively as ever. Beth regularly keeps fans updated about what her and Dog are up to via social media — and she just posted a photo two days ago of her all dolled up for a date night with Dog.